TAOISEACH LEO VARADKAR said the government is working on measures to “recognise the wrongs” done to those criminalised for homosexuality in Ireland in the past. Varadkar said a cross party motion to recognise the wrongs done to people convicted of homosexual offences will be debated in the Dáil. 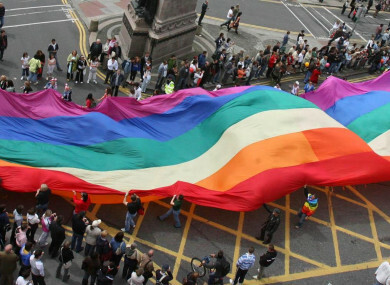 The Taoiseach also confirmed that the State will hold an event to mark the 25th anniversary of the decriminalisation of homosexuality at the end of this month. “For far too many decades members of the LGBT community were wrongly discriminated against and many were convicted on charges of being gay. In the UK, Turing’s law was passed to pardon all those who were convicted before decriminalisation was introduced. “I am aware that the Northern Assembly has passed a motion calling for a pardon. Will the Taoiseach indicate whether the government intends to bring forth legislation in this House to achieve a similar objective, namely, to pardon all those who were convicted?” Fianna Fáil leader Micheál Martin asked the Taoiseach today. He highlighted that some 50 people were criminalised under the laws at the time. “We are working on a motion, which I hope all parties can agree, to recognise the wrongs that were done,” he said, however, he noted that it is not a straightforward matter. “There is a complication in that it is not always possible to distinguish one conviction from another. In some cases, the convictions involve minors and it is not necessarily possible in all cases to distinguish whether the offence involved a minor, a point that makes things a little trickier in Ireland for reasons Deputy Martin will understand. “It is our intention to have an all-party motion in the spirit mentioned by the Deputy. Senator Nash is leading on this in the Seanad, along with Senator Buttimer and others,” said Varadkar. The legislation, calls the Criminal Law (Sexual Offences) Bill, was proposed by then Fianna Fáil TD and Minister for Justice Máire Geoghegan-Quinn. The bill removed Victorian laws from Ireland’s statute book which criminalised sexual acts between men. The move to make homosexual acts no longer illegal followed a 16-year-old legal battle which began in 1977, when Senator David Norris began a case against Ireland’s draconian laws. Norris’s case came before the High Court in 1980, where it was rejected, and before the Supreme Court in 1983, where it was also rejected by five judges who found that the laws which made homosexual acts a crime did not contravene the Constitution. Norris then took the case to the European Court of Human Rights, with the help of former President of Ireland, Mary Robinson (who was then a barrister), where judges finally ruled that Irish laws contravened the Convention on Human Rights. Five years later, the laws were changed. Speaking in the Dáil today, Taoiseach Leo Varadkar said the Irish government plans to mark the anniversary in some way, though the plans are still being finalised. Varadkar said he plans to reach out to former minister Máire Geoghegan-Quinn to inquire if she would like to be involved in such a celebration. The government press secretary said the Irish government is keen to mark the anniversary in “an appropriate manner”. Email “Taoiseach planning measures to 'recognise the wrongs' done to those criminalised for homosexuality ”. Feedback on “Taoiseach planning measures to 'recognise the wrongs' done to those criminalised for homosexuality ”.